Today’s entertainment environments demand an unparalleled experience. Whether one is at a venue, in a lobby or their own room, TV content needs to be more valuable and engaging while subtly supporting alternative revenue opportunities. FlexStream helps clients turn their venues, lobbies and overnight rooms into engaging and dynamic experiences. Whether it’s IPTV or RF featuring live action or broadcast channels accompanied by stats or social media, menu boards at concessions, targeted messaging in suites, fantasy stats at the bar, or a channel dedicated to upcoming events, FlexStream delivers dynamic digital content and video in a reliable and cost-effective manner. FlexStream was built with the understanding that technology doesn’t stand still. Through a single FlexStream interface you can manage, onsite or remotely, numerous technologies to support all of your AV needs. Integrating multiple components, and tying them all together with intelligent software, is what FlexStream is all about. This architecture mirrors that of the most sophisticated cable and broadcast TV headends but at a fraction of the cost. This simple, but powerful, concept creates just the functionality you need while simplifying installation, reducing support costs, and providing flexibility for the future. When you need more functionality, that same software will be there to make it happen. Our flexible hardware implementation, sophisticated software and remote management capabilities offer a unique way to create TV channels for your hotel, restaurant, school, house of worship, corporate office, multi-unit dwelling, senior living or care facility, prison, arena or stadium. Create channels from live or recorded video or blend that video with dynamic content, ranging from in-game stats, scores, advertisements, promotions, social media, fan interactions, sponsorship content, and more. 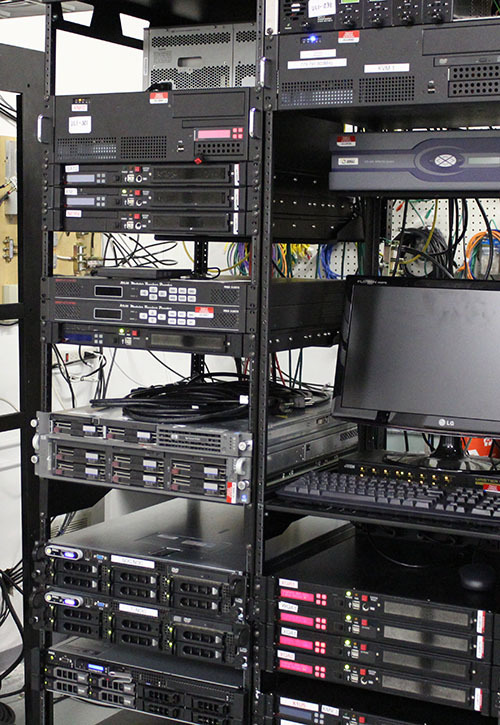 FlexStream was built to manage custom configured solutions to meet varying AV needs. Supporting full-screen content, L-wraps, event-based triggers, scheduled playback, and more. FlexStream works on your existing infrastructure (RF/coax or IP/cat6-fiber), FlexStream works to provide the best technology experience at the least expense to you. FlexStream allows you to monitor the status of the entire system, so errors can be fixed before your viewers find them. Manage all your facilities remotely without leaving your desk.